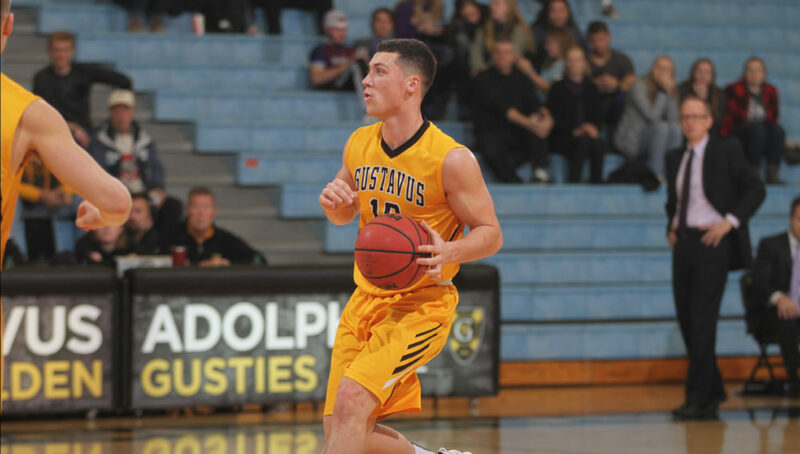 STORM LAKE, Iowa – The Gustavus men’s basketball team traveled to Buena Vista University on Tuesday night and lost by a score 77-68. The Gusties record drops to 1-2 on the season while the Beavers improve to 2-1. After leading 31-30 at the half, the Beavers jumped out to a 45-36 lead to start half number two but the Gusties battled back and took a 52-51 when Charlie Krambeer (Sr., Rushford, Minn.) connected on one of his four three-pointers in the contest. The game went back and forth for a few minutes and was tied at 56-56 before the Beavers went on a 18-6 run to take a 12 point lead and take control of the contest and secure the victory. Riley Sharbono (Sr., Marshall, Minn.) turned in a season-high point total for the Gusties as he totaled 22 points on 8-15 shooting to go along with four rebounds. Krambeer finished his day with 14 points and four rebounds and was the only other Gustie in double-digits. CJ Woda (So., Maple Grove, Minn.) was a perfect 4-4 from the field and he tallied nine points and four boards. Logan Rezac (So., Andover, Minn.) led the Gusties with six assists on the day, while Nolan Malo (Fy., Owatonna, Minn.) snagged a team-high seven rebounds. Gustavus outrebounded the Beavers by a tally of 35-28 and had 17 assists compared to 13 for Buena Vista, but they also turned the ball over 20 times compared to just 12 for BVU. The Gusties will next be in action on Saturday when they host Central for a 4 p.m. contest.